American citizens need a valid passport to enter the country, no Visa is necessary. There is an entry fee required of tourists entering by plane, and the one-time charge is good for the life of your passport. This reciprocity fee of $131 dollars is to be paid in U.S. dollars or credit cards (Mastercard, Visa, and American Express). When entering Chile (By cruise, vehicle or plane), at customs, travelers will need to fill out a tourist card that allows visitors to stay for up to 90 days. Travelers will have to present the tourist card to Immigration officials when leaving the country. Be aware that Hotels waive Chile’s 19% IVA tax applied to rooms when the guest shows the tourist card and pays in foreign currency. On flights leaving Chile, there is an airport tax of US $18, or the equivalent in Chilean Pesos. On domestic flights, airport tax is included in the airline ticket. A health certificate issued by any doctor stating that you are in good health. Plus an HIV test result. The following types of Visas all require the above documentation. You’ll need an enrollment certificate from any recognized School or University in Chile and proof of financial security, i.e. Bank Statement or Affidavit from your parents (if you’re a minor). This visa does not allow you to work. A student visa is good for a maximum of one year and is renewable in Chile. You must provide proof of financial security. This visa is good for a maximum of one year, renewable in Chile and allows you to work. You’ll need a contract approved by the Consular Division, Chilean Ministry of Foreign Affairs, signed by both, the employer (or his representative in Chile) and the applicant, and certified by a Chilean Notary. In addition, a certified copy of a college degree or letter of previous employers in the same field of work is needed. This visa has a maximum validity of two years and can be renewed in Chile. Are you going to Chile? 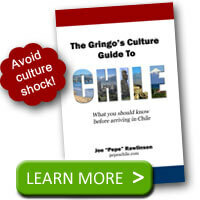 Your visa will help you stay in Chile but you need to be ready in other ways. 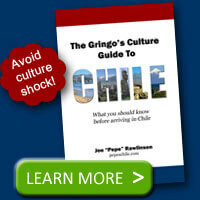 Avoid culture shock by reading the Gringo’s Culture Guide to Chile.